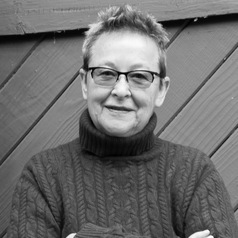 Adrienne Mayor is a folklorist and historian of ancient science who investigates natural knowledge contained in pre-scientific myths and oral traditions. Her research looks at ancient "folk science" precursors, alternatives, and parallels to modern scientific methods. She is Berggruen Fellow at the Center for Advanced Study in the Behavioral Sciences, Stanford, 2018-2019. Mayor's latest book, Gods and Robots: Myths, Machines, and Ancient Dreams of Technology investigates how the Greeks imagined automatons, replicants, and Artificial Intelligence in myths and later designed self-moving devices and robots. Mayor's 2014 book, The Amazons: Lives and Legends of Warrior Women across the Ancient World, analyzes the historical and archaeological evidence underlying myths and tales of warlike women (2014, winner of the Sarasvati Prize for Women in Mythology). Mayor's two books on pre-Darwinian fossil traditions in classical antiquity and in Native America have opened up a new field within geomythology, and her book on the origins of biological weapons uncovered the ancient roots of biochemical warfare. The Poison King: The Life and Legend of Mithradates, Rome's Deadliest Enemy won top honors (Gold Medal) for Biography, Independent Publishers' Book Award 2010, and was a 2009 National Book Award Finalist. It is the first biography in a century of the world's first experimental toxicologist, the brilliant rebel leader of a Black Sea empire who challenged Roman imperialism in the first century BC. Mayor is also a research scholar in the Classics Department; her work is featured on NPR and BBC, the History Channel, the New York Times, Smithsonian, and National Geographic and her books have been translated into French, Chinese, Russian, Turkish, Spanish, German, Italian, Japanese, Korean, Hungarian, Polish, and Greek. Mayor's fossil legend research is featured in the National Geographic children's book The Griffin and the Dinosaur (by M. Aronson, 2014). She was a regular contributor to the award-winning history of science website Wonders and Marvels (2011-17).